Prescale Measurement Films utilizing the microencapsulated colour principle can measure pressure, pressure distribution and pressure balance accurately. Prescale pressure film mono-sheet is as thin as 100µm that enables measurement of extremely low pressure. There are 7 types of Prescale available from 0.05 to 300MPa (7.25psi-43,500psi) covering various applications according to pressure level requirement. Pressure is detected and visualized by colour density. 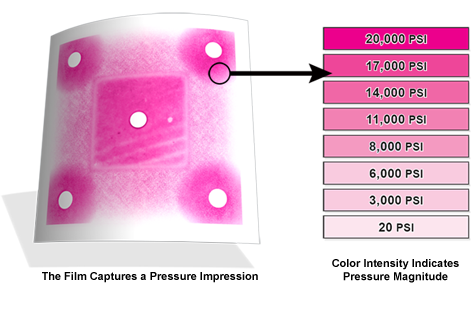 Build on the principle of microencapsulated colour, by reaching the necessary level of pressure, a few or more capsules break and show a colour shape on the colour-developing film. The colour intensity is proportional to the intensity of the pressure levels applied onto this area. 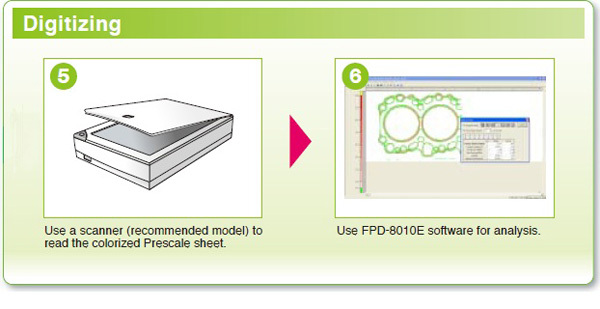 Fujifilm PRESCALE is synonymous with pressure indicating film, pressure sensitive paper, tactile pressure indicating sensor film, pressure sensitive film, Fuji pressure film, pressure tape, Fuji paper, or Fuji prescale film. The matt finish coated sides of each film must face each other. When pressure is applied, the microcapsules are broken and C film will react and generate a red color and its intensity is responding to the pressure level. Mono-sheet type Prescale film measures medium to super high pressures with one single sheet of film. A color-forming material and color-developing material are coated one above the other on a PET base material. When pressure applies on microcapsules, the color-developing material absorbs the color-forming material with a chemical reaction developing a red coloration. N.B. Do not to touch the coated side of A-film of Two-sheet type, the microcapsules can be broken and the color-forming material will attach to your hands. Prescale is the only film that measure pressure and pressure distribution in the world. Eight models of Prescale cover a wide range of applications from extremely low to super-high pressures with easy operation. It is recommended that measurements be taken in 30 to 60 minutes after the pressure has been applied. The color density gradually increases for several hours after the pressure has been applied and then, gradually decreases. For more details please download product guide and sheet pack details. More examples, please visit here. Please complete the enquiry form below for specific information and advice on Pressure Film.